Isn’t it cute? 😀 Plus, he can color in the fairy! 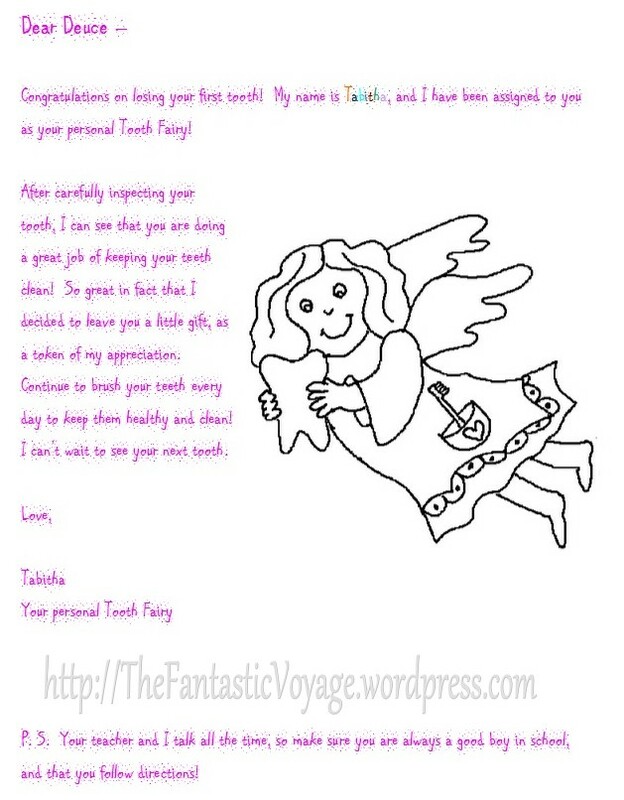 Also, via Google search, I found this supercute certificate. I paired them together and placed them in an envelope (with a gift! :D). Then I sprinkled some glitter in the envelope, sealed it, shook it, and taped it to his bedroom door. The next morning, when Deuce woke up for school, he quickly noticed his envelope. “Mom!” he exclaimed as loudly, yet as quietly as he possibly could. He didn’t want to wake his siblings, after all. Around the corner he came while I waited expectantly in another room. “Mom! My name is on my DOOR! Come see it!” He gushed with that special, innocent curiosity only a child can express – that moment that makes every parent’s heart smile – as he grabbed my hand and tugged me toward his bedroom. I took the envelope off his door and sat down. I showed him how to open the envelope with his finger (which he thought was a cool trick) and as he did, bits of glitter began to fall from the envelope. “Are those SPARKLES?! ?” he quietly squealed. I took the letter, gift and certificate out and showed them to him, then read him the letter. With his glistening, curious eyes he asked if he could keep them. “Of course you can,” I replied. Are you particularly proud of one of your own personal “awesome parenting” moment? I’d love to hear about it! Let me know, leave a comment below!